This entry was posted in News & Views, Quotes and tagged anarchy, atheism, Barbara Brown Taylor, conforming, deadly, force, God's will, hate speech, Jesus, law and order, religion, warning on January 6, 2019 by Ray Buchanan. This entry was posted in Facts & Statistics, News & Views, Quotes and tagged BLOTUS, civic love, Dan Rather, extremist ideology, hate speech, knife attack, Micah Daivid-Cole Flecher, open letter, Portland, Ricky John Best, sanctuary city, Taliesin Myrddin Namkai-Meche, violent extremist on May 29, 2017 by Ray Buchanan. I am alarmed that the number of documented hate crimes has risen dramatically since the election of President-elect Donald Trump. This isn’t just a coincidence. Our newly elected President’s ugly rhetoric, and viperous verbal attacks on our nation’s marginalized have encouraged many of his followers to act out their own hatred of those they they fear and those with whom they do not agree or understand. This cannot be allowed to continue. Those of us who live in love have to take sides. We have to speak out against every hate crime we see, and we must, likewise, take every opportunity to prevent hate crimes from occurring. Silence on this issue is not an option. We must take sides. We must stand with those being oppressed. And we must speak out against anyone (including the President, or any other leader), who engages in or promotes hate crimes, either verbal or physical. There is no neutral ground on this issue. Silence in the face of hate crimes is acquiescence. And I, for one, will not stand in silence in the face of intolerance and hatred. We must take sides. I am standing on the side of the victims. Whose side are you on? This entry was posted in Hunger & Poverty, News & Views, Quotes, Uncategorized and tagged choice, Donald Trump, election, Elie Wiesel, hate crimes, hate speech, intolerance, neutrality, oppression, President elect, quotes, silence, tormentors, verbal attacks, victim, victims on November 18, 2016 by Ray Buchanan. This is a critical understanding for the world in which we find ourselves. Our society is sinking ever lower into a culture of anger, bitterness, hate-speech, disrespect, fear-mongering and deceit. 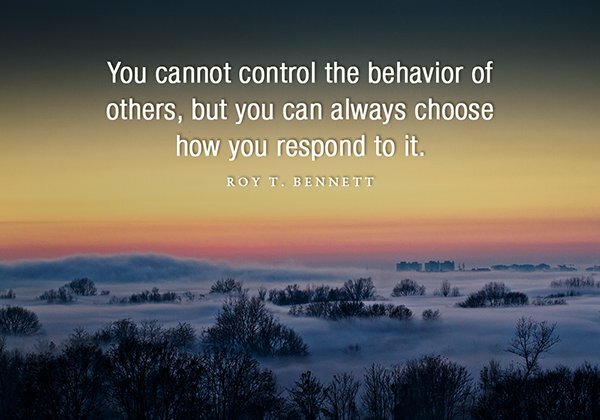 We may not be able to control the actions of those around us, But, we can always choose how we respond. We always have a choice. Basic morality, basic decency, and mutual respect should be the norms that provide the framework for our society. I, for one, choose to live by those norms. I am saddened to see those that speak and act in an intentionally divisive manner, purposely working to weaken and even break our bonds of community. But, I have a choice. And I choose to live and act in the knowledge that all of us are one global family. I choose to live in love. What about you? This entry was posted in Hunger & Poverty, News & Views, Quotes and tagged actions, basic decency, behavior, bitterness, choice, community, culture, deceit, disrespect, divisiveness, fear-mongering, hate speech, human family, love, response, Roy T. Bennett, society on September 23, 2016 by Ray Buchanan. 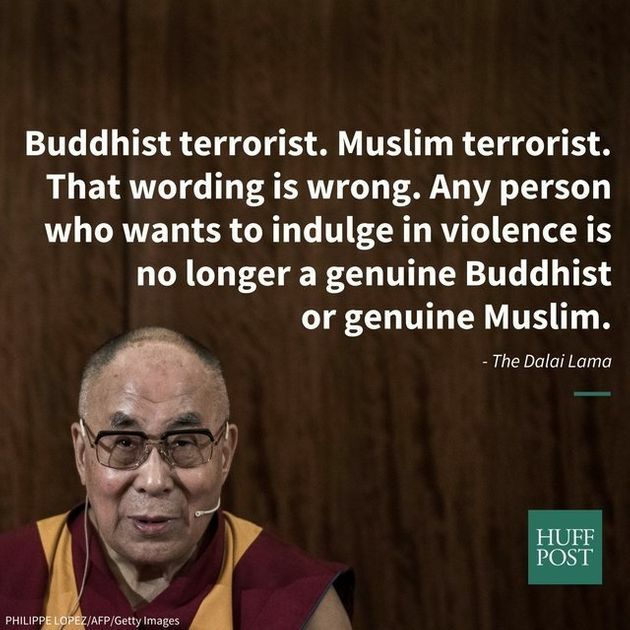 The Dalai Lama, long an advocate of peace and reconciliation among various faith traditions, recently declared that once a person or a group decides to indulge in violence they are no longer being true to their supposed beliefs. He pointed out that the Koran even states that once one commits bloodshed that person can no longer be called a follower of Allah. There is no room in Christianity for hate speech, xenophobia, and divisive rhetoric. Faithfulness to Christ means we love and accept each other even as we have been loved and accepted. Violence, even in response to violence, is not part of the Gospel. Faithfulness to Christ demands more. The faithful Christian response to terrorism is love. The faithful Christian response to terrorism is forgiveness. Anything less, as the Dalai Lama would say, is to be untrue to what we proclaim we believe. This entry was posted in News & Views, Quotes, Spirituality & Religious Writings and tagged Allah, Buddhist, Christian, Dalai Lama, divisiveness, faith traditions, faithfulness, forgiveness, God, hate speech, Koran, love, Muslim, reconciliation, religion, spirituality, terrorist, violence, xenophobia on September 21, 2016 by Ray Buchanan. 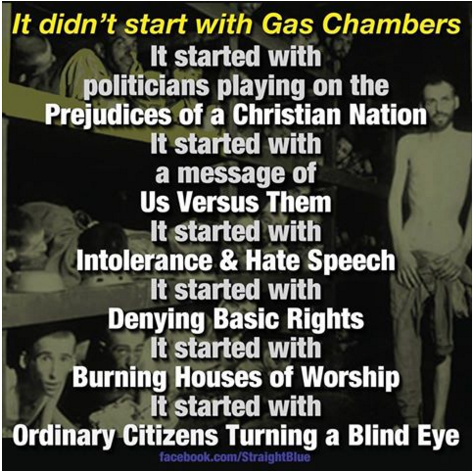 Knowing history can keep us from repeating it. Concern over the direction our country is moving is not enough. Faithfulness calls us to step up and speak out against the hate speech, racism and bigotry that is being encouraged. Hate speech is not a Christian value. Loving others more than we love ourselves leaves no room for racism and bigotry. Christians need to demonstrate the love of God by our acceptance and respect of those different than ourselves. And we all need to have the moral courage to speak out against the ugly rhetoric that has become a part of the current political campaigns. This entry was posted in Facts & Statistics, Hunger & Poverty, News & Views and tagged basic rights, bigotry, Christian nation, citizens, faithfulness, gas chambers, hate speech, history, Houses of Worship, intolerance, love of God, moral courage, politicians, prejudice, racism, turning a blind eye, us versus them on January 12, 2016 by Ray Buchanan.